What Makes My Cat a Part of My Family? Bijou is a singularly patient cat. 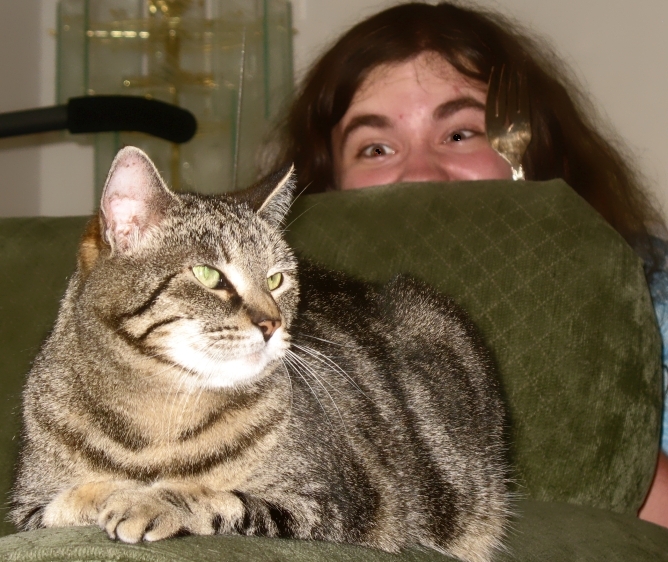 As you can see from the featured image of my son pretending to stalk the cat with silverware, it’s often that someone is testing her infinite patience. Sometimes she is putting up with our whims and fancies, our impromptu trips, or kids dressing her up occasionally like a WWI soldier 0r a fairy princess. And when push comes to shove and she can’t take the behavior of silly teenagers any longer, she does what every cat does. She just smacks the dog. Other times she is cuddling the sick, sad person who needs some company after a bad day. Her presence is what makes this house a home. In the living room, whether she is rolling around on the floor playing with shoelaces,or sunning herself on the back of the couch, she is always surveying the landscape, ready for interaction with family. In the dining room, she sits patiently awaiting bits of brisket, chewing with little teeth, and looking at us expectantly for more. In the kitchen, she hunts for the occasional mouse in winter, sitting dutifully in front of the oven. In the kids’ rooms, she makes her rounds, waking each up at each child at least one time per night, either to let her out, feed her, or pet her. When outside, she follows us as we perform yard work, stretched out in the shade, patiently watching over us. She’s walked the kids to school before, and has observed as we flew kites. She helps guard the cherry trees from would-be pilferers in the form of neighborhood birds, and she leaves the feathers on the porch to thank us for the opportunities a cat has for take out (or dine in). In the Spring, she steps onto new, budding lawn for the first time, daintily hopping from one foot to the other. At Easter she helps us untangle masses of plastic neon-green Easter grass for baskets. In summer, she watches us barbecue on the back porch and offers her services as a taste tester. In autumn, the rustle of leaves under her paws makes for a fun, impromptu game of leaf batting. At Thanksgiving, she sits, patiently awaiting a bird bigger than even her to rest on the table. At Christmas, this amazing animal even inspects the ornaments dangling from the tree by batting at them (sometimes going to far as to climb the tree to do it). That’s one dedicated animal. Our playful, sweet, soft mess of fur is ever present in every room, during every holiday, season and moment with our family. She more than makes out house a home; she is home. lives on yourcatstory.com, catchow.com, facebook.com/purinacatchow, and youtube.com/purinacatchow. Enter a story during June and July and participants have an opportunity to win $5,000 and a one-year supply of Purina Cat Chow. aww, loved this story, Jamie! My daughter’s cats (they were once mine, too) have equally forceful personalities. At the age of 4 our son named our solid black cat, “Checkers.” Go figure. Loved that cat, and she lived a nice full life, finding field mice and birds when we lived in the heart of Cajun country… those were the days! Such a fun story. My granddaughter’s cat will be 20 and my granddaughter will be 21 on their birthdays next month. She is still active and loves attention. For Nutritional Consultation, please feel free to call me @ 512-878-9546. Enter Your Email Below to Subscribe to Our Newsletter!